There are some shops that always catch my eye because of their fantastic window displays/visual merchandising and on the corner of Bond Street this shop in particular whatever time of day always makes me stop and window gaze. It is one that I have never been into and have always thought it is the type of place only the likes of my father would enter through the door of. 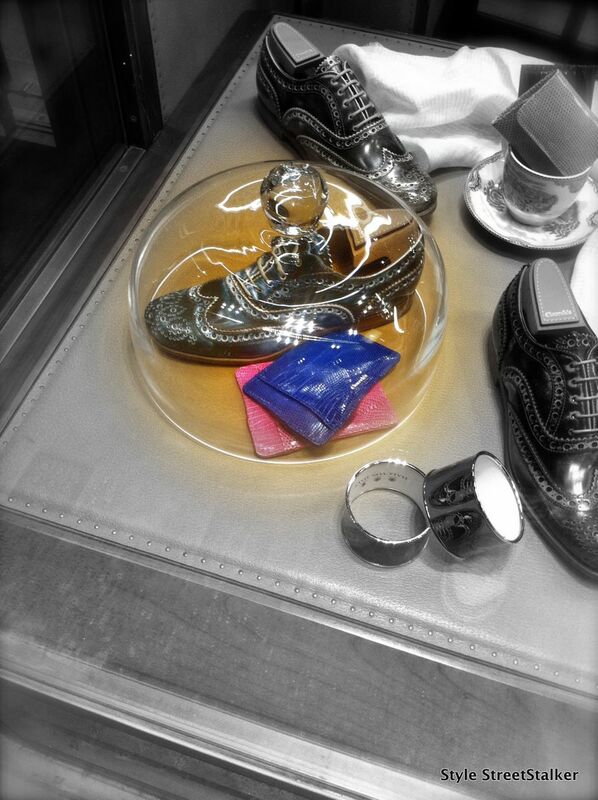 The shop is Churches, founded in 1873 the brand is steeped in history and a very traditional menswear shoe brand, but like many heritage brands it has achieved the ability to developed with the times and now offers women’s shoes and season led designs. Last season they launched their studded brogues which were divine, this season the brogue riding boot has been redesigned and brought into the 21st century with what looks like almost stone washed leather in different colours.. I am obsessed and have put saving for the new MacBook on the back burner until I can grab a pair of these! 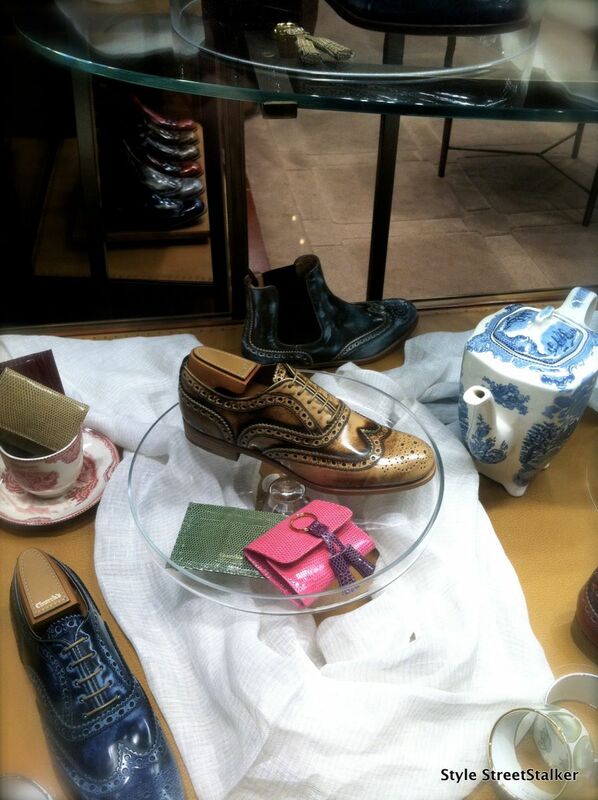 This month’s windows are certainly worth a double take, shoes are displayed like precious items under glass jars. 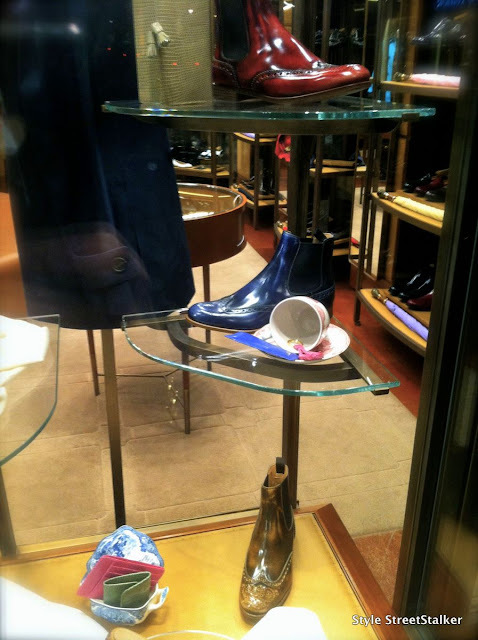 Old French Marie Antoinette style cups and saucers are scattered around bursting with coloured eye catching bright leather wallets and card holders making it clear even before you walk into the shop that they sell far more than just shoes. Considering this is such an old brand their window displays have hit the spot with regards to turning a window shopper into a potential customer .. which I intend to be as soon as I can get my mitts on a pair of those brogue riding boots!